Some of you know my fitness journey (AKA the Accidental Fitness Quest). I started out years ago with a personal trainer because I had no idea what I was doing. I’d never worked out before and had no idea how to use anything in the gym. I could have used resources online or in magazines for a program, but I wanted to learn a little as I went along so I could figure out what to do on my own eventually. Trainer Man was amazing in both teaching me the ropes and answering endless questions. After working with him for a year or so, I got certified in personal training, learned about and got certified in fitness nutrition, and began working with clients. All this time, I worked out without fail. I hit the gym several times a week. I did cardio. I was even on a competition team for a bit. They sent workouts each month with exercises, sets, and reps that I did faithfully. So clearly I’ve got the dedication and knowledge on what to do. Even though I’m confident in my abilities and have a well proven track record, I noticed something interesting. It’s hard to be objective all the time when it comes to yourself. What are my physique weak points? I always thought it was my shoulders since they were so small, then a coach assessed me for competition prep and told me my strong point was my well rounded and capped shoulders. Um, what? Having someone assess my physique, take note of any weak or strong points, and incorporate those details into my program gives an objective view. They don’t have a skewed mirror view like you may have about yourself. The competition team sent only sets and reps, and I was to determine the weight to use. It felt hard and I thought I was doing well, but hmmm. I noticed sometimes I’d use the same weight for several weeks in a row. So I bumped it up a notch when I searched for and found my current coach. Confession: Sometimes if I was in a hurry and I had to walk around to locate the weight I needed, I’d use the closest one and call it good enough. Ha, admit it. You’ve done this too. We all sometimes take the easier way out to save time. Having a trainer pushes you when you may not, but also when you have to report in to them. That extra push really gets you better results, but it also works the other way too. Sometimes I found myself bumping the weight up too often. Pump more iron, let’s do this! Occasionally we need a reality check since more isn’t always better. If you increase too much, you can often hit a plateau faster and need more frequent weight breaks. Controlled weight or rep increases can go a long way towards moderation while still getting you the progress you’re after. Having someone who knows what they’re doing can rein you in and tell you that you need to take a break. He is an objective voice to notice issues and weaknesses. When weights aren’t going up like they should be, it’s often human nature to keep pushing when a different approach may actually work better. He’s well worth it to me (<— understatement of the year here) since he keeps things fun, holds me accountable, pushes me hard, and gets me results. It’s definitely worth it to not wonder if I’m making progress or using the best approach, I know I am. As good as I am at workout programs, I’m a macro magician and my passion is nutrition programs. I love food, what can I say. I can tweak client physiques as needed with one hand behind my back, but it’s different when it comes to me personally. He handles that too because most women (sorry, ladies!) cannot be objective when I comes to their weight. Lose weight, bulk? We almost always get that wrong unless someone is there to hold our hand and help us decide. Even if we pick the right one, we often panic part way in and need someone to talk us off the ledge. I would have pulled the plug on my bulk… oh… like twenty different times as I watched the scale go up. Thankfully I had a coach who gently pushed me on, reasoned with me, and I bulked on. I now have more muscle to show for it. No thanks to me and my self-sabotage. So yes, even coaches have coaches to keep them real and achieving goals. Hey, Flex Lewis has Neil Hill and calls him Yoda. Yeah, I’ll spare Ryan that kinda nickname. I just call him The Master and envy his burrito making skills. You’re welcome, Ryan. 😉 From time to time, I even get to create Ryan’s program and set his weights for him. Clearly from his picture above he knows what he’s doing, but he likes to change things up every now and then. I love giving him a few lifts that he’d never put in himself, and I may giggle just a little when I design the payback torture. Do you think front squats for push presses is an even trade? Shhhhh! 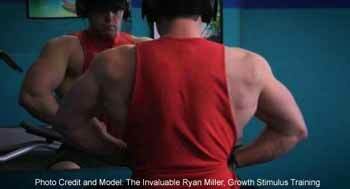 Think about these things as you design and implement your own workout and nutrition programs. If you aren’t seeing the results you want or even if you just want to be confident that you have an objective viewpoint, consider working with someone who can provide that for you. If you’re interested in working with me, I’d love to talk about your goals and we can get started before the New Years influx. You can read more about my online programs and also read what clients have to say about working with me.